Digitization and disruptive technologies are changing our world. This creates completely new areas of application and unimagined growth potential. With the Institute for Robotics and Intelligent Systems (IRIS) at ETH Zurich, the asset management at Credit Suisse promotes application-oriented research in robotics. Get exciting insights into this world in an interview with Wyss Zurich Founding Co-Director Roland Siegwart and Filippo Rima, Head of Equities at Credit Suisse Asset Management (page 18; in german). 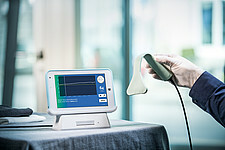 Prof. Dr. med. 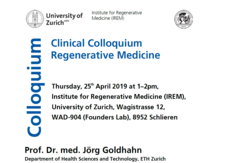 Jörg Goldhahn (Department of Health Sciences and Technology, ETH Zurich) will talk about "Medical translation as a process" on Thursday, April 25, 2019 from 1.00 - 2.00 p.m. at Institute for Regenerative Medicine (IREM), University of Zurich, Wagistrasse 12, WAD-904 (Founders Lab), 8952 Schlieren. 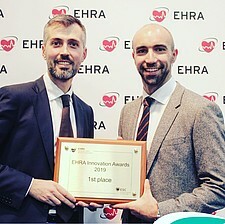 Our Wyss Zurich project HYLOMORPH has been awarded the first prize for outstanding and groundbreaking innovations at EHRA2019. Congratulations! 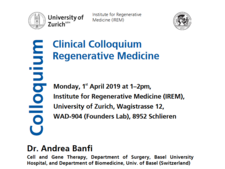 Dr. Andrea Banfi (Cell and Gene Therapy, Department of Surgery, Basel University Hospital, and Department of Biomedicine, University of Basel, Switzerland) will talk about "Therapeutic Angiogenesis – from Vascular Biology to Regenerative Medicine" on Monday, April 1, 2019 from 1.00 - 2.00 p.m. at Institute for Regenerative Medicine (IREM), University of Zurich, Wagistrasse 12, WAD-904 (Founders Lab), 8952 Schlieren. 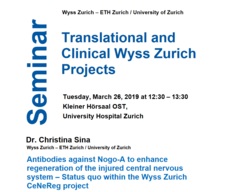 Dr. Christina Sina (Wyss Zurich – ETH Zurich / University of Zurich) will talk about "Antibodies against Nogo-A to enhance regeneration of the injured central nervous system– Status quo within the Wyss Zurich CeNeReg project" on Tuesday, March 26, 2019 at 12:30 – 13:30 p.m. at University Hospital Zurich, Kleiner Hörsaal OST. Our Associate project MINT&Pepper is currently offering a programming workshop for young people at Schweizerhof Lenzerheide. When? February 13 – March 2, 2019. Where? Schweizerhof Lenzerheide. Who can participate? Youngsters ages 8-15. Cost? CHF 10.00. 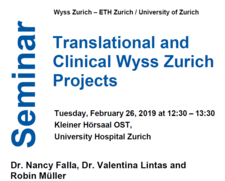 Dr. Nancy Falla, Dr. Valentina Lintas and Robin Müller (Wyss Zurich – ETH Zurich / University of Zurich) will talk about "Tissue-engineered human matrices to repair and regenerate the heart – Status quo within the Wyss Zurich LifeMatrix project" on Tuesday, February 26, 2019 from 12.30 - 13.30 p.m. at University Hospital Zurich, Kleiner Hörsaal OST. 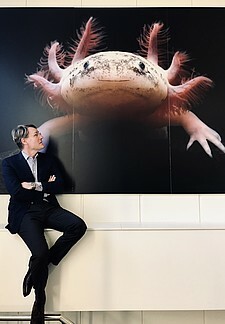 Tages-Anzeiger journalist Felix Straumann paid a visit to Wyss Zurich Founding Co-Director Simon Hoerstrup. Are you curious about our story? Find out more about our Co-Director and the mission of Wyss Zurich. 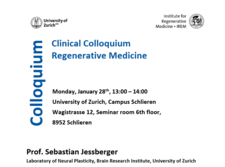 Prof. Sebastian Jessberger (Laboratory of Neural Plasticity, Brain Research Institute, University of Zurich) will talk about "Elucidating the molecular and cellular dynamics of neurogenesis" on Monday, January 28, 2019 from 1.00 - 2.00 p.m. at University of Zurich, Campus Schlieren, Wagistrasse 12, Seminar room 6th floor, 8952 Schlieren.